If Minecraft: Story Mode‘s first eight-episode run wasn’t quite enough to satiate your appetite for all things blocky, you’re in luck – Telltale has confirmed that a second season is on the way. Starting July 11, the season two opener, Hero in Residence, will be available to download on Xbox One, PlayStation 4, PC and mobile devices and will continue to document the heroic acts of protagonist Jesse from the first season. Spread across the usual five episode structure established with Telltale’s other interactive adventures, all choices made during the course of season one will, according to Telltale, carry over, although it should also serve as a suitable jumping off point for new players, should they wish to skip what’s come before. Whichever camp you fall into, see below for Telltale’s scene-setting description of the upcoming season. 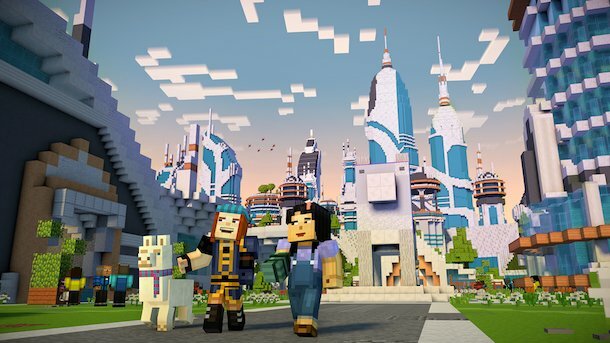 Besides confirming the return of actors from season one (Patton Oswalt, Catherine Taber and Ashley Johnson), Telltale also reveals that several YouTube personalities from the Minecraft community will have cameo roles and that a new Crowd Play feature will debut. As the name suggests, Crowd Play will enable others to play alongside you by voting independently on important story choices. With development on the third season of Telltale’s flagship The Walking Dead series now at an end, it was inevitable that the studio would have something primed and ready to fill the gap it left behind, and Minecraft‘s certainly got the audience to justify a second round. Telltale’s yet to provide a trailer for Hero in Residence, but you can likely expect one to arrive either at E3 or within the next few weeks. Stay tuned for more.